The Slayers series started out as a set of short stories, penned by Hajime Kanzaka and illustrated by Rui Araizumi. These were followed by a group of novels which inspired the first of three 26-part television series, which began airing in April 1995 in Japan. The Slayers universe is divided into two timeframes, with the three TV series following the Slayers storyline, while the OVAs and movies follow the Slayers Special (or SP.) storyline, which occurs prior to the Slayers series. Where the main character, a powerful sorceress named Lina Inverse, is accompanied by her male companion Goury in the Slayers series, her arch rival Naga the Serpent joins her in the Special series, with Goury nowhere to be found. 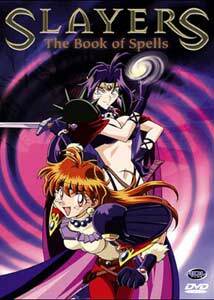 Slayers: The Book Of Spells is a three part OVA, based on the Special storyline. It was released in 1996 following the conclusion of the original Slayers TV series. Each episode is selfcontained, and pit the two heroines against a variety of opposing forces. The Scary Chimera Plan opens with a mad scientist named Diol (Takeshi Aono) planning to use Lina Inverse (Megumi Hayashibara) to create a Super Chimera, with Lina as one of the heads! Not liking the idea one bit, she blasts the Diol with one of her patented explosive spells, though gets Naga (Maria Kawamura) in the concussion as well. None the worse for wear, Naga joins her on the road again where they meet up with some bad guys sent after them, who along with Naga again, get blasted. When she meets up with the Diol once more, Lina discovers his new secret weapon, which is ten times more than she bargained for. This is no laughing matter! Jeffery's Knighthood finds Lina and Naga striking up a deal to make a man out of a proud woman's (Rihoko Yoshida as Josephine) son, though as expected, they didn't know what they were getting into. Due to momma's influence, the boy (Akira Ishida as Jeffery) has far too much trust in his abilities, but when anyone suggests otherwise, they had better beware of a certain masked figure waiting to pound them into the ground. His quest is to become a Royal Guard, but the plot in place to achieve this goal isn't going as planned. The girls must rely on their wits and their considerable assets to pull this one off. The final episode, Mirror, Mirror, sets our heroines against Lagan (Banjo Ginga), a renegade magician who has stolen a mythical mirror that duplicates his enemies as their opposites. So just what is the opposite of a fire wielding, redheaded sorceress and her well-endowed, scantily clad accomplice? I'll leave you to discover that one. Slayers: The Book Of Spells is a fun series where the girls are always being underestimated. Sight (and sound, ahem) gags and precarious situations abound. The big difference with this set (pun intended), is Naga, with her ample and gravity-defying assets on display throughout the series—there is no shortage of fan service here! Violence is relatively tame, and the stories have many memorable moments. Animation quality is very good, with some wonderful backgrounds throughout, and I really enjoyed the theme music and songs in the third OVA, though the amount of subtitles was a bit overwhelming with dialogue plus song lyrics in English and Romanji onscreen simultaneously. Not for the young kiddies, but pretty entertaining for a more mature audience. Image Transfer Review: Video quality looks very good, though there are a few areas of shimmer and interlace artifacting present. Colors are solid and rich, with good black levels and contrast. Audio Transfer Review: Audio is presented in stereo on both the original Japanese and English dub tracks. Spectral coverage is fine, though faint hiss was present on the Japanese track, along with a couple of minor dropouts. While the English dub is serviceble, I'd recommend sticking to the Japanese track, as there are some liberties taken in the translation. Extras Review: We get three trailers for the Slayers series—two for the motion picture, and one for the OVAs. Previews for other ADV titles are include in a submenu (which I greatly prefer over their front-end trailers), which include Lost Universe, Gasaraki, Martian Successor Nadesico, Generator Gawl, Orphen and Ruin Explorers. A production profiles section features still frames from both the character design and background development for each episode. Sitting in the dark, I had a hard time figuring out how to navigate these, though had I paid attention to the insert card, it is explained that you use the play button to go forward through the frames, where the chapter buttons move you from one series of pictures to the next. This is actually more responsive than navigating regular menu-based stills, though you can't go backwards. There is a fair amount of rainbowing present in some of these stills however, which range in number from ten to twenty-six per section. The insert card has instructions for accessing the production profiles (along with a memorable quote from Naga), backed by advertising for four other ADV titles, all of which have trailers on the disc. ADV has given us the complete set of Slayers Special OVAs on one disc. From the previews on other ADV discs, I wasn't sure I'd like these, but I'm now a fan. The interplay between Lina and Naga is great, and the stories, while not mind-boggling are certainly entertaining. Good popcorn fare and a decent presentation get the thumbs up from me for this one for anime (and fan service) fans.